At Chess.com you can play your chess games anywhere, any time, in any way. Every day, players from around the world play more than 1 million chess games from home, work, and on the go. Enjoy chess your way! Play online any time in any browser! Play 1 minute bullet up to 2 hours games with 20,000+ players online. Play chess at your pace, and as many games as you want. Make your move and then get an alert when it is your turn. Think you can beat a top chess engine? Play chess against the computer at different levels from beginner to master. You don't know how good (or bad!) you are until you have stacked up against other players. Join a tournament and find out! Play and learn chess anywhere on your iPhone or iPad! Download the FREE app from iTunes today. 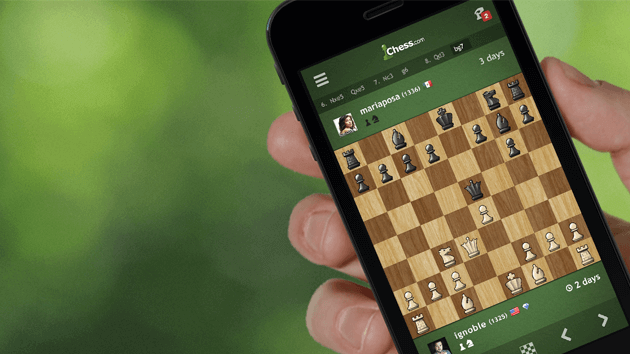 Take Chess.com with you anywhere on your Android phone or tablet! Download the FREE app from the Google Play. Love chess but hate memorized openings? Play Chess960 (also known as Fischer Random)! Are you ready for the battle? Challenge the computer to a chess960 (Random-Fischer) game. Doubles Chess, also known as "Bughouse", is played by four players in two teams of two playing on two different boards! Enjoy a game of three dimensional chess with a full 3D board that can rotate, shift, and feel like a real chessboard!